The customer experience is all. In commerce, quality of service is intrinsic to loyalty and reputation. In public safety, lives can depend on agents answering calls and gathering accurate information fast. Government agencies are required to deliver access to services quickly and easily. Red Box Quantify is a powerful voice and data recording solution that gives you the tools to help you improve skills and moral throughout your organization by providing a way to monitor quality, assess employee performance, and provide personalized coaching and training. Call recording can hold a mirror up to your organisation and highlight to managers the training needs of individual employees as well as whole teams. Choose Quantify QM for a quality monitoring and management system that rolls call assessment, reporting and coaching into one easy-to-use software application. With Quantify QM’s built-in scheduler, managers and team leaders can automatically – on-demand or on a daily, weekly, or monthly basis – retrieve and listen to calls for pre-selected or random agents. Retrieved calls can be evaluated against pre-set or custom questions and once an area for improvement is identified, a coaching session can be created and agent-specific objectives assigned. When an appraised employee logs in to QM, they can review their evaluation and provide notification of when set objectives are achieved. Engagement drives staff performance and retention. With Quantify QM you can target coaching and training where it matters by providing real examples of how agents have handled calls to demonstrate good practice and better ways to work. With every call recorded and smart search and replay capability, it’s easy to retrieve the examples you want. Finding the call content you need to demonstrate best practice or inform an internal quality audit could involve reviewing lots of recordings. 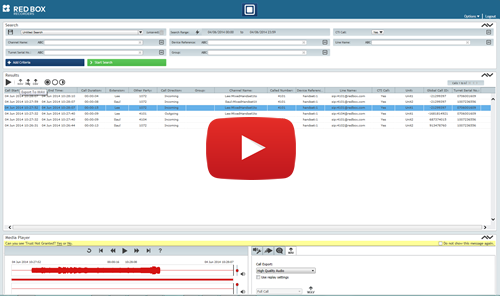 With Red Box Quantify AudioSearch you need just minutes to identify perfect examples of calls required. This powerful application searches the spoken content of recordings for key words or phrases to pinpoint and retrieve communications to support training and coaching.